Timber Pro UV’s Deck & Fence Formula Wood Protectant will: Stain, Seal, and Protect most wood species that are used for outdoor exposure such as cedar, fir, pine, redwood, teak, exotic hardwoods, cypress, mahogany and more. 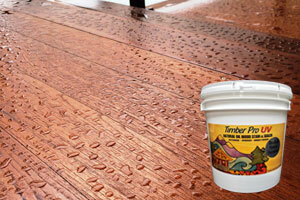 Timber-Pro’s Deck & Fence Formula is the result of 20 years of research. We are way ahead of the other major brand name sealers who scrambling to convert their hazardous products into ones that are permissible with new environmental restrictions. Our unique wood finishes protect your outdoor wood with durable penetrating renewable oils that are carried deep into the wood by water. Once the water evaporates during the drying process it leaves behind a naturally tough wood protectant with very low odor (34 gpl VOC content). Oil based… yet water borne, a winning combination. Our oil resins bond and cure into a hard, non-sticky finish that will not attract dirt, dust, or spores so it will not promote mildew like many other waxy or soft oil wood sealers, primarily made from petroleum oils. The fact that our plant oils penetrate, then dry and bond is why it lasts so long, protecting your wood better than most brands. Timber Pro’s Deck & Fence Formula repels water and stabilizes your wood without the hazardous chemicals found in wood preservatives. Manufactured in the great Pacific NW, family owned and operated with pride. Available in 25 beautiful, natural, transparent wood stain colors that allow the grain and knots to show through, or 22 semi-transparent stain colors for embellished color. Also available in Clear UV for wood that gets no direct sun and doesn’t need the UV-blocking tints. Learn how to stain a deck by reviewing our application guide.